Britain's coalition government pressed the reset button on the UK Economy during summer 2010, as it has continued to make a plethora of tax raising and spending cut economic austerity announcements over the past 9 months in an attempt to get a grip on the Labour government's legacy of an out of control annual budget deficit of over £150 billion per year that risked bankrupting Britain. These policies on face value imply severe economic distress for several years as they are implemented starting in 2011 and thus require the continuing lubricant of near zero interest rates backed up by quantitative easing aka money printing to inflate the economy (consumer and asset prices) in an attempt at offsetting public sector deflation so as to prevent a nominal double dip recession. The big gamble that the coalition government is playing is that its programme for economic austerity will prevent market interest rates from rising as they have done so in the bankrupting PIIGS for the whole of 2010 and into 2011, pushing these economies into economic depression. The Coalition governments primary aim is to engineer an economic outcome that sets the scene for a spending and tax cutting induced mini boom into a May 2015 General Election that would favour at the very least a continuation of the Coalition government or more probably an outright conservative victory. However the coalition government faces many headwinds during 2011 that could disrupt its economic plans, most notably soaring inflation that has long since left the UK official target of CPI 2% behind as well as internal political pressures as the Lib Dems buckle under austerity induced dissent , let alone external pressures form first the Euro-zone to more recently imploding Middle East states buckling under their own inflation mega-trends. Therefore this analysis seeks to conclude in a trend forecast for UK Interest rates in determination of the degree to which the Coalition government will be able to manage to keep UK interest rates low (base and market) during 2011 to enable the target trends for the economy to be achieved. As mentioned in the June analysis (29 Jun 2010 - UK ConLib Government to Use INFLATION Stealth Tax to Erode Value of Public Debt ) coalition spending cuts will not prevent total UK debt from increasing by over 50% the next 4 years. This is as a consequence of the budget deficit that will persist into the 3rd year of the cuts programme as illustrated below, which anticipates the abandonment of the cuts programme during 2013 as the Coalition government starts to gear itself up towards generating an election boom into May 2015. Therefore the Coalition's spending review did not alter Britains' path towards a debt mountain total of £1,262 billion for 2013-14, an increase of 50% on the 2009-10 total of £784 billion (as per original analysis of June 2010). The impact of a 50% increase in total debt also implies at LEAST a 50% increase in ANNUAL debt interest payments to £70 billion, up from £34 billion for 2009-10, which also illustrates the error in the argument of those that state that the Coalition government is cutting too much too fast when the facts are that it is not cutting any where enough to have any impact on accumulating UK debt. Britain's current debt situation continues to target £118 billion budget deficit for 2011-12. UK Interest Rates - The implications are for the continuing need to keep UK interest rates on hold for 2011 and beyond so as to service the ever expanding debt mountain. The Frankenstein coalition government is adopting socialist measures that squarely targets the middle class to pay for the price for Labour's incompetence, far worse than that which the labour government had planned to do by effectively taxing the middle class to over 70% of their earnings (40% Income Tax + 12% NI Tax + 20% VAT + 5.1% RPI Inflation (inflation is a stealth tax that the population has been conditioned to view as beneficial when it is actually an earnings and savings purchasing power destroyer). The policies announced to date only pay lip service to spending cuts on an out of control welfare state with the largest budgets that deliver no output for additional resources such as the NHS being ring fenced for growth. The consequences of this is that government spending will NOT be cut and instead continue to increase every year from £680 billion for 2009-10 to at least £739 billion for 2014-15. Average 19% cut per government department over 4 years. Aim to eliminate structural deficit (£81 billion) by 2015. Additional benefit cuts of £7bn on top of £11bn already announced (mostly child benefit cuts). There are two important factors to take into account when considering the headline grabbing statements of departmental cuts of upto 30%. a. That the cuts will be phased in over 4 years. b. That inflation of approx CPI 3% to 4% per year has to be considered. This means that allowing for the impact of inflation AND phasing in means that actual spending cuts will be far less in both nominal and percentage terms because inflation annually will lift the spending budgets that are being subject to phased nominal cuts. For example a £100 billion budget in a year would rise to £103 billion after 3% inflation, therefore a £10 billion cut over 4 years would itself be indexed for inflation which it would not be if all of the the cuts took place in the first year. I.e. in the example £10 billion of cuts in the first year would result in a year 4 budget of £101.7bn, whereas phased in cuts of £10 billion would result in a budget total of £102.2bn as a consequence of inflation. Therefore as per the example, the total actual cuts over 4 years would be £23 billion against £40 billion if all if the £10 billion was immediately cut. The following graph translates the announced cuts into spending department budget totals as phased in over the next 4 years (2014-15) after being indexed for inflation at a conservative 3% per year. Therefore the coalition government is failing to implement ANY meaningful cuts in what remains out of control Government spending. The coalitions policy on tuition fees illustrates a government that is anti-education and destroying the ability of the country to generate future wealth. 1. Tuition Fees will rise from £3,300 to £9,000 saddling graduates with an estimated average debt of £40,000 with all of the consequences both psychological and financial in terms of credit ratings where the debt will impact on graduates for the next 30 years of their working lives. 2. 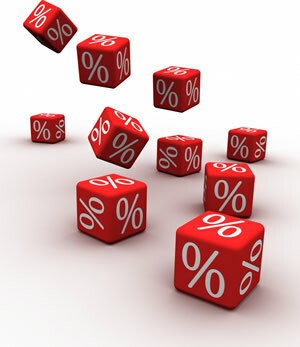 That the debt interest will be at Inflation (RPI) Plus 3% (8.1%), against the current student loan interest rate of 1.5%. The overall effect is to make university education less palatable to all sections of the population as all will feel the financial and psychological pressure of being saddled with £40k of debt as soon as they leave University and try and get their first entry level job, especially as the high interest rate ensures that the debt total will continue to soar at a rate that is greater than average earnings growth. UK Interest Rates - Whilst the mainstream press and vested interests in the public sector focus on headline grabbing spending cuts and tax rises, the facts are that a highly inflationary LARGE BUDGET DEFICIT will continue to persist regardless, that coupled with inflationary tax rises as the population responds by demanding higher wages to compensate, the Bank of England / government understands this as a policy for high inflation to devalue the value of the deficit and total accumulated debt, therefore regardless of what the Bank of England states publically, the actual policy is for high inflation plus low interest rates. The Coalition (as did Labour before) have let off hook those who are responsible for the financial crisis i.e. the banking sector with the Bank of England at its head. The power to print electronic money is delegated from the central bank by means of fractional reserve banking which creates the booms and boosts between alternating trends of out of control credit creation followed by credit destruction with high inflation always seen as the solution. However what Mervyn King will never acknowledge is the fact that the Bank of England is THE PRIMARY REASON why the banking crisis occurred, because it lies at the very heart of Britains fractional reserve banking system that allows bankster's to bank bonuses on the basis of fictitious tax payer funded profits and then dump the losses onto tax payers i.e. profits are privatised whilst the losses are nationalised. Instead, our current fraudulent banking system exists where the Bank of England prints money that is loaned out on leverage to the bankrupt banks so that they can go and buy government bonds on even more leverage, resulting in huge profit margins for near zero risk. The Banks then treat these government bond holdings as assets against which they can create many multiples of electronic money in the accounts of borrowers, loaned out at exuberant interest rates in many cases X20 the rate of the base interest rate that Banks can borrow at from the Bank of England. The system is designed to generate literally unlimited profits for the bankster elite, and if the banks lend too much then the socialist banking system ensures that the ordinary tax payers will be forced to step in and bailout the banks at any cost and ensure that all bond holders are protected at 100%. This is NOT capitalism, this is socialism. Capitalism is a mechanism for the allocation of capital towards whichever business is profitable, and as long as the business is profitable the business is financed, if the business stops being profitable then capital is reallocated to other ventures that could prove profitable. Capitalism is not conjuring money out of thin air that is loaned out to ANY business whether it is viable or not amidst a credit boom (as there is unlimited money), and then when the bubble bursts have tax payers step in and cover ALL of the banking sectors losses after bank officers have banked bonuses on fictitious profits, leaving hollow husks behind for the tax payers to cover the liabilities of. That is not capitalism, this is fraud on the tax payers of Britain, far greater than any mafia don could ever hope to achieve. Interest rates are near ZERO so as to allow the bankrupt banks to maximise the amount of profits they can make as they borrow at 0.5% and then leverage it up by the fractional reserve banking system to between X10, X20 and higher, then go on and buy government bonds at 3% which implies an instant profit 25% to 50% all courtesy of the Bank of England and Tax payers. In America the tea party movement has risen up against the blatant frauds that are taking place such as Hank Paulson, the ex CEO of Goldman Sachs effectively engineering a £700 billion theft from taxpayers to the bankster's. Isn't it time for the middle class of Britain to also wake up to the fraud of the socialist fractional reserve banking system that seeks to destroy the value of a life time of savings? UK Interest Rates - One of the primary objectives of Bank of England's is to continue to funnel tax payers cash onto the balance sheet of the bankrupt banking sector for which low interest rates is one of the primary mechanism as the Bank of England remains petrified of the potential for the Banking Sector to trigger Financial Armageddon. The UK Economy apparently went into reverse gear on the recent release of shockingly bad preliminary GDP data for Q4 2010 of -0.5%, against economist expectations averaging at +0.5%. George Osbourne and other Coalition government ministers immediately stepped forward to blame the weather. However the snow at worst accounts for 0.4%, therefore most of the drop of 0.6% (1% difference) is due to retrenchment ahead of austerity to bite during 2011 as private sector firms seek to protect themselves against weaker demand by bolstering balance sheets. 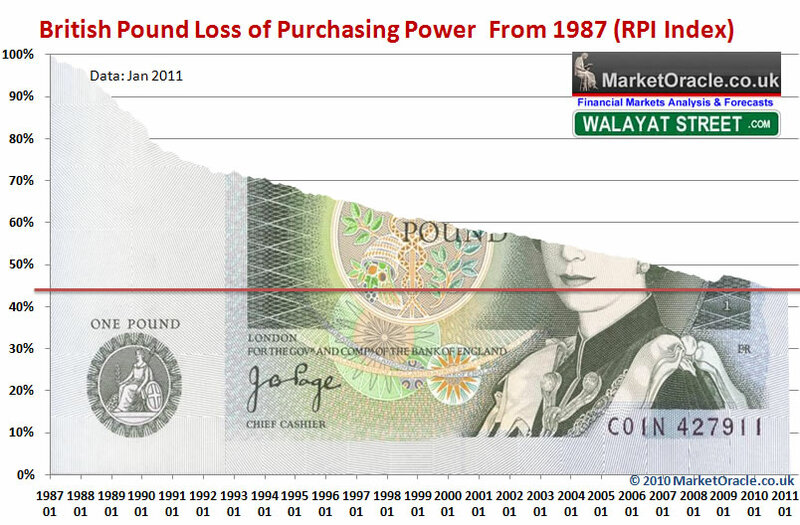 The below graph illustrates the forecast trend for UK GDP (ABMI chain linked at market prices, change on year earlier). The UK GDP Growth trend forecast was updated following the June Emergency Budget that resulted in a revision for 2011 growth from +2.3% to +1.3% (09 Aug 2010 - UK Economy GDP Growth Forecast 2010 to 2015). My expectations remain for Growth of between 1% and 1.5% for the next 3 years.The Coalition government is constantly being pulled in two directions one socialist and one free market orientated. This makes it less able to react to bad economic news and therefore suggests that the coalition government is terrified at the risks of another recession over the coming years and rising unemployment. This suggests that the Coalition government will want to avoid interest rates rising for as long as possible,which also ensures further QE and therefore this part of the analysis points to continuing low interest rates throughout 2011. UK Interest Rates - Contrary to the public statements of the Bank of England of targeting 2% inflation, the actual facts are that the Bank of England since October 2008 is more focused on targeting a minimum of 2% GDP, which given recent data illustrates a reluctance for the Bank of England to raise interest rates until it see's annual GDP north of 2%. However, the failure of the Bank of England to respond to high inflation is not sending a reassuring message to industry to invest, therefore to strengthen the economy, ironically the Bank should give 1 or 2 token rate rises. which given the forecast trend therefore suggests a great deal of reluctance to raise interest rates during the next few years. The Bank of England MPC members continue with their mantra of temporarily high inflation due to short term factors. One could cut and paste from any inflation statement from MPC members of the past 12 months to hear the same propaganda out of the Bank of England. The question everyone should be asking the BoE is when does temporary high inflation stop being temporary? Originally it was for a couple of months, now it is over a year, will high inflation still be temporary a decade from now? For that is how long I expect the Inflation Mega-trend to run. Yes given technological innovation then deflation should be the normal environment for an economy, if it where not for big governments with big ideas on how to stealth tax the populations wealth and spend it on even bigger and usually worthless projects. Another word one could use for deflation is productivity, each year the productivity of workers increases due to innovation and new technologies which means that the price of goods and services should fall as workers become more efficient in their production and thus the value of hours worked increases. Off course this only tends to happen in the private sector as the public sector ironically becomes LESS productive the bigger it becomes as the number of bureaucrats expands exponentially until the economy folds under its weight, as witnessed by the NHS where a tripling in the budget under Labour has basically resulted in a tripling in the number of bureaucrats employed. This puts the economy into a perpetual worsening state as the Public sector displaces the far more productive and competitive private sector both on the large and small scale, for example small local post offices have been closing across the UK due to lack profitability. However many councils have responded by stepping in to re-open some of the small post offices with grants of say £50k a year towards their running costs, therefore no tax paying private sector postal service will ever be able to again step in to provide a service as it cannot compete against a perpetually subsidised loss making local postal service. So in our topsy turvy government brainwashed world, we are repeatedly told that DEFLATION is bad, if not evil, and that INFLATION is good, something to leap with joy at the prospects of seeing our wealth disappear down the inflationary spiral. Governments love inflation because it allows them to expand the size of the state which is the natural instincts of ALL governments no matter the political party, as once politicians get into office then out goes the ideology that they used to get elected and off they run to enjoy the trappings of the state as they seek to make their mark on history. You may at this point interject and state that the current UK coalition government is issuing statements left right and centre that it intends on cutting this that and the other to get a handle on the countries public debt mountain! Only one problem, the coalition government is not going to cut the debt at ALL! they can't cut the debt because the last Labour government has ensured that the gap between that which the government spends and earns is unbridgeable, all that the governments can do is erode the purchasing power of all workers and savers in the economy through inflation which devalues the value of the current total debt of approx £1 trillion with at least another £250 billion due to be added over the next few years, that THIS so called spending cutting government will rack up during which is why the Bank of England and Treasury pump out propaganda on the economy that never matches reality such as that the inflation rate is always destined to converge to 2% in 2 years time. for example if UK inflation compounds to 28% in 4 years time (RPI 5% per annum), then that means total debt of £1.2 trillion would be worth £864 billion i.e. Little change from the present! Hey presto the budget deficit is gone whilst the debt burden remains constant. But who has paid the price for this apparent miracle? The bond holders, savers and workers by means of inflation AND taxes on illusory nominal economic growth due to inflation. How Much of Your Wealth Has Been Squandered by the Last Labour Government ? Well for that we have to take a look at the governments preferred inflation measure, the CPI index which despite under reporting real inflation still shows that the Labour government between April 1997 and May 2010 stealth taxed your wealth and earnings to the tune of 28% to give you the illusion of prosperity, whilst all the time enabling the government to go on an unfunded public sector spending spree to grease the palms of those who are most likely voted Labour. However the problem is that the greater the debt burden in terms of % of GDP then the greater will be the future rate of inflation, which currently looks set to wipe out another 28% of the value of your wealth during the next 5 years which will be WITHOUT the benefit of illusory inflation linked pay rises. Savers at this point may argue that they receive interest on their savings or enjoy capital gains on invested assets (despite the financial crash and bankster designed fraudulently investment instruments that result in only making money for the financial institutions rather than investors). The government has thought of that too and steps in with ANNUAL taxes at the marginal rate on interest at 20% to 40% (depending on your tax band), and capital gains are also taxed. Which ensures savers / investors are going to find it very difficult to prevent the government from stealing your wealth as the system is designed to virtually guarantee that your wealth will eventually end up in the Treasury. On the other hand if there were no inflation then the rate of income tax on interest would not matter as you would always earn more than the inflation rate which is ZERO and neither would capital gains tax matter. Still it gets even better during deflation where due to increasing productivity general prices should fall so the value of your savings even if the rate of interest is ZERO increases, off course governments cannot allow for deflation because they are no longer able to steal your wealth. So to gauge when UK interest rates will rise, we need to gauge what level of inflation will the coalition government consider as dangerous for the economy, as clearly 4% despite being above the BoE target is being ignored. I suspect that the Bank of England and Government have privately long since geared themselves up for substantially higher inflation for many years, far beyond the upper limit of 3% which will come to be seen as period of low inflation as a consequence of the need stabilise public sector debt in terms of percentage of GDP especially if the government expects to achieve its target for debt at 65% of GDP by 2015-16 which I just do not see as being possible, the most probable outcome is debt stabilising at an inflation induced 71%. UK Interest Rates - As mentioned earlier, the Bank of England's PRIME consideration is NOT the targeting of 2% CPI Inflation but 2% GDP, additionally the Bank of England also targets the monetization and devaluation of government debt and support for the bankrupt banking sector, so has multiple targets, the weight if which is favouring the maintenance of low interest rates. Risk is that the Bond Markets puke on the relentless supply of public debt, especially as the Government is expected to fail to achieve its deficit and Debt to GDP reduction target, impact probably delayed to 2012. Those in other countries such as the United States are on a similar path to the UK, which similarly implies much higher future inflation as a consequence of their own stealth debt default trend. In fact the longer the U.S. Fed delays in forcing up US interest rates then the higher it will have to spike in the future as the larger will be the debt burden to deal with in terms of % of GDP. Therefore academic expectations for Deflation in the USA (deflationistas have become more rare in the UK) is a continuing construct of delusional freakanomics. You still continue to hear a lot of deflation in the BlogosFear and mainstream press, however the whole deflation argument is a delusion the reasons for which I covered at length in an earlier article (26 Aug 2010 - Deflation Delusion Continues as Economies Trend Towards High Inflation). Basically deflationists are living in either the 1930's or somewhere in ageing population shrinking Japan. They are not living in either the UK or the USA or much of the rest of the world. Deflation in our fraudulently fiat money printing central bank governed world cannot exist, not whilst governments run budget deficits that continue to pile on ever more debt that demands inflation to erode its real value away as already mentioned earlier and the price for which is being paid for by the CURRENT generation not future generations which is another consensus driven myth that exits purely to condition the population into accepting the frauds of deficit spending, debt accumulation and inflation. Delusional deflationists that populate the mainstream media have been instrumental in ensuring that the likes of the stocks stealth bull market (02 Feb 2010 - Stocks Stealth Bull Market Trend Forecast For 2010) will continue to run for many years because they miss the most fundamental fact that asset prices are leveraged to consumer prices. Deflationists say don't worry if the data does not fit, just change the methodology, as I warned would happen nearly a year ago that once proved to be wrong the deflationists will attempt to either rewrite history or change the definition of what inflation actually is which is precisely what is happening today (18 Nov 2009 - Deflationists Are WRONG, Prepare for the INFLATION Mega-Trend ). Such as attempting to change the debate from Deflation vs Inflation to Deflation vs Hyperinflation ! When Hyperinflation is the END GAME ! When populations PANIC and lose confidence in the currency and hence dump it for anything from consumer goods to hard assets, which in our fast moving financial world probably mean that hyperinflation would occur within a matter of hours rather than months as Weimar Germany experienced during the 1920's. So hyperinflation is akin to market crashes i.e. something that cannot be forecast as to when it will occur but rather one can protect themselves from in advance of by engaging in Wealth INFLATION PROTECTION strategies rather than following the bankrupting deflationists recommendations such as parking ones money in cash or government bonds which are guaranteed to lose you ALL of your money as the first signs of hyperinflation would occur in the bond and currency markets, long before prices in the shops soar and the lagging official inflation indices surge higher! Inflation and Tax Rises Crush Britain's Middle Class, Real Earnings 25% Drop! Clearly Britain's workers are being squeezed hard by a multitude of government policies that manifest in negative real earnings growth as the government seeks to use the stealth tax of inflation to erode the value of the ever expanding public debt mountain, where at least half of the annual budget deficit is as a direct consequence of the fraudulent actions of the banking sector, the price for which is continues to be paid for by the workers of Britain. The UK Average earnings graph illustrates the real terms loss of purchasing power of earnings against both of the official inflation measures (CPI, RPI) which may surprise many to learn is not a recent phenomena but that the trend of negative real earnings growth has been in force since mid 2008 and is now approaching 3 years of punishment for workers for the crimes of bankster's that makes a mockery of the propaganda being pumped out by vested interests in the banking sector and coalition government that the tax payer is sitting on profits on banking sector capital injections (which I will came back to later in this article). The in-depth analysis and forecast for UK inflation for 2011 (17 Jan 2011 - UK Inflation Forecast 2011, Imminent Spike to Above CPI 4%, RPI 6% ) concluded in UK inflation spiking to a high of 4.2% early 2011, and thereafter trend lower towards 3% by the end of 2011 remaining above the Bank of England's 3% upper limit for the whole of 2011. However, crude oil going super nova as a consequence of the breakout of freedom in the middle east, that could result in the oil price spiking as high as $200 would see UK CPI break above 7%, resulting in a far worse blood bath for the workers of Britain than the on going bankster bailout feeding frenzy. Middle Classes To Lose as Much as 25% of their real earnings. Whilst the poor can rely on benefits and the rich can rely on capital growth to profit from asset markets being inflated by the central banks far beyond the official inflation indices. However that leaves 70% of the British population that class themselves as being middle class to feel the full force of the Inflation and economic austerity mega-trend. Whilst many students (middle class wannabe's) have woken up to a near tripling of the debt burden they will be placed under, however, the situation for Britains vast middle class is set to get far worse than that which even the dire inflation outlook implies because on top of the inflation stealth theft of wealth and wage purchasing power there are a series of tax rises and benefit cuts due to hit the middle class workers of Britain and especially those with children as taxes rise such as national insurance, and tax allowances are cut, and benefits (tax reimbursements) such as tax credits are reduced and in many cases totally withdrawn which means middle class workers could be hit by an additional loss of earnings purchasing power of 5% per annum on top of the real inflation theft of at least 3% per annum, none of which features in any Bank of England or Government economic propaganda report. Whilst trying hard to refrain from using expletives here, but the middle class of Britain is truly FQ&*ED! Middle class families will typically be poorer by between 15% and 25% by April 2013, as from Jan 2013 many benefits will be cut such as the universal tax free child benefit payments being ripped away that alone amount to a loss of 7% of disposable income for a £45k wage earner with 3 children, that is destined to break the backs of many a middle class family fighting hard to stay above water in the wake of soaring prices. Tip - The way for workers to avoid loss of child benefit is to ensure each parents taxable earnings are below £42,375, one way to achieve this is to make a payment into a personal pension fund that would bring taxable earnings to below £42,375. There are a number of other mechanisms such as salary sacrifice and using cash ISA's to have savings interest excluded from taxable earnings. To illustrate the severity of the situation, the loss of 15% to 25% of real earnings needs to be compared against the accumulative loss of purchasing power of approx 4% under Labours disastrous last 2 years in power, as Labour effectively sought to bankrupt the country so as to maximise seats won at the May 2010 General Election and deliver the Conservatives a scorched earth economy as I began warning of since at least mid 2009 (31 May 2009 - Labour Governments Bankrupt Scorched Earth UK Economy for the Conservative Government ). There will be a great deal of pain, for worse than anything experienced during that of at least the past 30. The workers of Britain need to prepare themselves for this pain by taking action now to both protect their wealth and pay down debts as this trend given the governments persistently high budget deficit that continues to accumulate a ever higher debt mountain is likely to last for the whole of this decade. The net result of the inflation and economic austerity mega-trend will be that a decade from now half of the middle class will have disappeared and have been forced to join the working class. It is not too incredulous to suggest that where the middle classes of Egypt is today is where the middle class of Britain will be in 10 years time, the politic consequences of which will be for the re-birth of socialism which will mean far greater long-term economic pain for everyone! The risk that the Bank of England and Government is running is that people feeling real pain of contracting real earnings see through the Smoke and Mirror statistics of nominal growth and realise that persistent high INFLATION is pure and simple THEFT of their wealth and start demanding far higher pay rises than the official inflation rate, which I am sure that the implementation of the austerity cuts will act as a triggering mechanism for, this will make all workers far more militant and therefore many more strikes will breakout during 2011 and into 2012-2013 as the middle class of Britain revolt against severe contraction in earnings and erosion of wealth. The effect of many more striking workers will be INFLATIONARY, because even marginally less goods and services produced act to force up prices, a ratcheting up effect, the higher inflation goes the less control the government or Bank of England will have over inflation as it will become LESS responsive to future interest rate hikes because people start to lose faith in the currency, as they don't want to hold onto something that is fast losing its value, they want to get rid of it, SPEND it on goods and services that they will find increasingly difficult to purchase with diminishing real wages. Governments are always playing a dangerous game with inflation because governments NEED inflation to DEVALUE the DEBT, but populations REACT to persistently real high inflation by increasingly demanding higher pay far beyond that of discredited official inflation indices i.e. to make up for the shortfall in tax rises and benefit cuts that is expected to range upto 25% per annum loss of purchasing power by April 2013, and thus become highly reluctant to hold onto fiat currency as they seek to consume goods and services as soon as possible, and savers seek out hard assets or alternative currencies. Another point to consider is that the spark for high inflation has already been lit by the budget busting mega black hole across the Atlantic that is burning the worlds reserve currency as though there is no tomorrow, in which respect there is no way that the British Pound will be able to escape its event horizon as both the dollar and sterling are heading for the same final destination regardless of volatility between the currency pairs that gives the illusion of a rising pound. The implications for UK interest rates will be covered in my next in depth analysis and concluding forecast to be imminently completed, ensure you are subscribed to my always free newsletter to get this analysis and forecast in your email in box. UK Interest Rates - The Bank of England primarily fears the wage price spiral, ironically raising interest rates could contribute towards igniting the wage price spiral as it would put the highly indebted workers of Britain under even greater stress that would manifest in worse civil unrest, strikes and more forceful wage demands. Therefore as there is no sign of an imminent wage price spiral given average earnings growth of just 1.1%, rate rises during 2011 would be counter productive. The inflation forecast for 2011 warned that the key risks to the forecast were all to the upside and specifically if Crude oil were to go super nova during 2011, subsequent events starting in Tunisia, magnifying in Egypt and now exploding in Libya have sent crude oil prices soaring into the stratosphere as speculators pile into a panic sparked trend, where Brent Crude has now spiked higher to $115 on the spot market, up $40 from the recent trading range of $75 and leaving the US WTI Crude presently lagging behind at $101. Brent Crude oil of $115 if sustained would translate into an inflation rate of CPI 5%+ as prices at the pumps are ratcheted higher by at least 7p per litre, however the explosion taking place in the middle east appears to be just beginning as the freedom storm turns to the oil rich gulf states with the mafia dictatorship of Saudi Arabia at its head. However it is not necessary for the these mafia chiefdoms to actually collapse, rather the risk alone is enough for speculators to pile in and producers hoard crude oil in lieu of higher future prices, that could send the crude oil prices soaring to first break the 2008 $150 peak and then target a break of $200 amidst a short-lived mega-spike. Whilst it is not possible to forecast where crude oil prices will exactly peak, however it is possible to estimate where Brent crude of $150 would translate into an UK CPI Inflation rate of 6%, and $200 of 7.5%, especially given the fact that Sterling today is much lower than where it was during the Commodity spike of mid 2008 as the below graph illustrates that crude oil in sterling is already within touching distance of its all time 2008 high rather than which is suggested by the dollar price that the mainstream press mistakenly exclusively focuses upon. The above graph shows a tendency for crude oil prices (in sterling) to act as a leading indicator for UK inflation of between 6 and 18 months. With normal expectations for a lead of between 6-12 months, depending on the overall state of the economy, which given that the UK economy is in a slow recovery mode then the tendency will pull the lead against UK inflation nearer towards 6 months. The strong trend higher in crude oil during 2009 has resulted in high UK inflation throughout 2010. The current surge in sterling crude oil prices, even if it succumbs to some profit taking in the short-term looks set to translate in a summer UK CPI inflation rate of 5%+. UK CPI Inflation at 5%+ would make a mockery of the deflation fools that populate the Bank of England's Monetary Policy Committee that have mistakenly beaten the deflation drum for the whole of 2010 and into 2011. Inflation of 5%+ would put increasing upward pressure on UK Interest rates as the markets would force the Bank of England to raise interest rates so as to continue to service a still huge government budget deficit via the bond markets that targets £120 billion for 2011-2012. Therefore the outcome as I first voiced over 6 months ago (26 Aug 2010 - Deflation Delusion Continues as Economies Trend Towards High Inflation ) would start to manifest itself in that the Bank of England would both raise interest rates AND print money so as to monetize government debt as the market interest rates would otherwise have to be far higher than what has been an increasingly irrelevant base interest rate would imply i.e. above 4% for 10 year gilts. UK Interest Rates - Crude Oil being sustained in the range at $110 to $120 would result in Bank of England being forced by the market to raise interest rates to hold sterling debt (government bonds) as well as reduce commodity price pressures by pushing the British Pound higher regardless of the consequences for lower economic growth. UK Interest Rates - Crude Oil being sustained north of $150 would result a global recession and trigger panic at the Bank of England and around the Coalition Governments Cabinet table, this would result in interest rates being kept low, and more money printing so as to generate economic activity regardless of the inflationary consequences. Sterling's bounce of of the December floor of £/$1.54 to currently hover around £/$1.62 illustrates market confidence in the new governments austerity measures relative to that of the United States and even more so when one looks at the bankrupting PIIGS of the euro-zone. My last in-depth analysis and concluding forecast for was for a volatile up-trend towards a target of £/$ 1.85 by Mid 2011 as illustrated by the below graph (04 Oct 2010 - British Pound Sterling GBP Currency Trend Forecast into Mid 2011 ) . Though as is always the case, a rise in sterling is just a manifestation of the relative volatility between currencies that are all in state of perpetual free fall against one another due to the fact that the money via various means such as fractional reserve banking, or more overtly Quantitative Easing is constantly being printed therefore currencies are constantly losing value that is measured by the inflation indices, whether official CPI 4%, RPI 5.1% or more realistic MO 6.6%. Therefore holders of any fiat currency should seek to minimise the time for which it is held as holders cycle between differing asset classes. Whilst an upward trend in sterling will reduce inflationary pressures and thus make interest rate rises less likely, however contrary to the consensus view of academic economists, that interest rises drive currencies higher. In actual fact currencies, in this case the British Pound acts as a leading indicator for interest rates in that sterling starts to rise well before interest rates start to rise, anywhere from 1 to 2 years before hand, given that sterling bottomed in Jan 2009 and then again in May 2010, a minimum lead time of a minimum of near 1 year now exists for base interest rates to start to rise. UK Interest Rates - Sterling trend leads UK base interest rates by usually between 1 and 2 years, which given the two lows of Jan 2009 and May 2010, buts sterling into this time window that signals rises in base interest rates. The consensus academic view is therefore wrong that interest rate hikes push currencies higher, when the actual fact is that interest rates follow currency trends, instead academics will focus on why a strong currency means interest rates should not rise, which is the exact opposite (so wrong as usual).